While visiting family in Utah, I spent a good amount of time helping a son buy a used car. Here I'd like to share a few experiences that might help others dealing with cars and car dealers. Not directly relevant to Mormonism, though the themes of being frugal, living providently, and being able to help others do so are among the practical parts of our faith. Come on, home teachers, make sure your people don't get ripped off when they buy cars. One hot trend in Utah and elsewhere is the selling of salvaged cars. This includes cars that were totaled in an accident. While the insurance company determined that the car was too badly damaged to ever be properly repaired, rebuilders can buy these scrapped vehicles and fix them up so they look great. They can then be resold for much less than the normal value of the undamaged car. The title report (accident report) from sources like Carfax.com should show that the car is salvaged, which should be a huge red flag to knowledgable buyers. The rebuilt car may look great, but it's hard to know what structural damage is still there. The frame may be twisted so the car won't handle safely at high speed or won't provide proper protection in an accident. There may be engine or transmission damage that won't show up until later. Many insurance companies won't insure a rebuilt, salvaged car. It is best to avoid them. Unfortunately, many buyers don't know this yet. One of the common scams that we ran into 3 times (a high percentage of the cars we examined) involves a "mistake" from the dealer in the listed VIN number. Often one digit is changed in a published listing so that a would-be buyer can't quickly see the accident report. If there is an error, walk away from the car and probably from the dealer. We found even significant, notable dealerships offering salvaged cars with errors in reported VINs. Beware. If someone tries to sell you a car but says they have lost the title, walk away. It may be because they are trying to hide the fact that the title will show it has been rebuilt or highly damaged. The title may also have been "washed" by registering it in multiple states until someone fails to include the salvage/junk annotation on the title. Don't rely on the title alone: be sure to get the title report from the dealer (many good dealers provide them) or run a vehicle history report from Carfax or other reputable source. Beware the scams of "free title report" sites that only give you a little bit of information and require you to pay to get the actual report. Just go straight to a reputable commercial report. Be wise. Do your research. Buy a reliable car and spend your money wisely. Watch for warning signs of dishonest dealers and be ready to walk away. Don't let high-pressure techniques and smiling faces lure you into buying something over your budget or at an unfair price. Business is always best when done with honest, fair people, but even then, be prepared for somethings to go wrong. 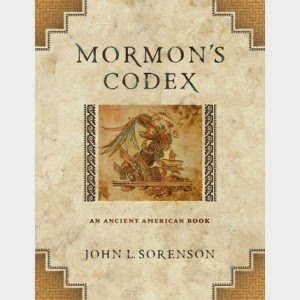 I just finished John L. Sorenson's monumental work, Mormon's Codex (Provo: Neal A. Maxwell Institute, 2013). The reading took longer than I expected, but it was worth it. I will have more to say about it in the near future, but here's an initial review. Sorenson's work will be viewed by many as an attempt to prove and defend the Book of Mormon using numerous random parallels and weak threads. This view both fails to grasp the value of exploring many dimensions of a physical and cultural setting when trying to evaluate a fragmentary record from an allegedly ancient source. Sorenson's work does directly support Book of Mormon plausibility, but it also helps us to better understand the Book of Mormon and its peoples. It helps us understand the region they lived and the many dramatic as well as subtle influences on their lives from the climate, the landscape, the surrounding peoples, the cultural setting, the plants and animals, the horticulture, the religions and languages, the patterns of war, infrastructure and social economy, political practices, and so on. Sorenson explores these in terms of what we scholars have learned about Mesoamerica and what we can draw from the Book of Mormon text, and then examines the correspondences and implications. The result is increased granularity and plausibility for the Book of Mormon record, and more informed questions for the future and new hypotheses to test. Along the way, some former objections to the Book of Mormon are soundly shelved. Mormons limit their ability to fully grasp the Book of Mormon when they dismiss its geographical setting as something unimportant. True, the Church has no official position on geography, and it is certainly secondary to the teachings about Christ, but the its authors felt physical details were important enough to riddle their text with references to them. It's a gritty text, linked to physical details, not just theoretical platitudes and lofty doctrine. Book of Mormon authors bothered to cite specific hills, valleys, rivers, cities, and lands with names and real physical locations carefully and accurately woven into the story. There are temples, thrones, prisons, fortifications, markets, and social structures to match: priests, kings, lawyers and judges, soldiers, and merchants. In some cases, these details matter a great deal and are part of the message for our day. Such things are not the trappings of Native American life Joseph Smith could have gleaned from his upstate New York environment, but they are elements of authentic Mesoamerican culture in the only place that offers hope of plausibly locating the places built into the text of the Book of Mormon. They matter not just for validating or defending the text, but for better understanding what happened, to whom, and why, sometimes with added understanding in drawing lessons for our day and our lives. The reasons why Mesoamerica is clearly the most reasonable setting have been discussed elsewhere and are again touched upon in Mormon's Codex: the requirement for an ancient tradition of written language, the existence of many elements of civilization found in the Book of Mormon (armies, kings, temples, taxation, and complex social structures), the narrow neck of land, and many other details with major implications such as the apparent volcanism and seismic activity described in the text. These broad issues force us to consider Mesoamerica as the most reasonable candidate for the setting of the Book of Mormon, but if so, can the details of the text correspond in any degree with the details of Mesoamerica? This is the issue tackled by Mormon's Codex. Literally hundreds of "correspondences" between Mesoamerica and the Book of Mormon are identified that create a powerful case that the Book of Mormon really does have its origins in Mesoamerica, so much so that scholars would be wise to reconsider the Book of Mormon as the most extensive surviving document from the ancient New World, a precious ancient codex that can teach us much outside of its spiritual message. One can accuse Sorenson of "parallelomania," straining to find parallels that really aren't significant. Parallelomania is often seen in attempts to find plagiarism in the Book of Mormon. Sometimes seemingly impressive parallels can be piled up that, upon closer inspection, are contrived and can be simply due to chance or situations that naturally involve common phenomena. For example, in a written description of war in texts from Joseph Smith's day, one should not be surprised to find descriptions of battles, prisoners taken, casualties suffered, defenses built, weapons stored, and so forth. These are common to war. It is in the uncommon details where we can see elements that may be meaningful parallels. Chance can always account for some intriguing finds, so we must be careful not to make too much of any one factor. What makes Sorenson's work so interesting is the abundance of intricate correspondences coupled with insights from the proposed physical setting that repeatedly enhance our understanding of the text. The relationship between the Olmecs and later Mesoamerican peoples is one of the broad issues that fits the Book of Mormon remarkably well, with the rise and fall of the Jaredites and the subsequent remnants of Jaredite culture found in the Book of Mormon corresponding well in numerous ways with Mesoamerica. It's an area that challenges unwarranted assumptions we have long made about the destruction of the Jaredites. A more informed approach must recognize, however, that in the midst of the civil war and chaos the ended the Jaredites in the Book of Mormon, that many people would have fled and survived. Since the Book of Mormon itself provides abundant internal evidences of an ongoing Jaredite tradition, with Jaredite names like Corihor/Korihor (Ether 7, 13, & 14 and Alma 30) and Nehor (Ether 7:9 and Alma 1) cropping up among the Nephites, generally associated with dissenters who had not fully bought into Nephite traditions. The remnants of Jaredite society among Nephites and Lamanites fit in well with the ways Olmec culture continued to influence Mesoamerica after their fall. What I found especially in Mormon's Codex were the specific details of individual sites fit with the Book of Mormon. For example, Sorenson proposes a Mesoamerican archaeological site known as Santa Rosa as the city of Zarahemla. The archaeology of that region can accommodate the text effectively. Santa Rosa was a small chiefdom in the 3rd century BC with evidence of Olmec influence in its past, similar to what we might expect if it had been occupied by the Mulekites that had taken on the Olmec influence of their region when they arrived. From 75 BC to 50 AD, Santa Rosa saw a huge burst of activity, reaching its peak of socioeconomic activity at the time Zarahemla was experiencing its peak under the reign of judges. "Like the Central Depression [of Chiapas] as a whole, Santa Rosa was abandoned from about ad 350, very near to when the Nephites at last fled from the land of Zarahemla" (p. 586). Understanding Mesoamerican warfare helps us recognize, for example, that Onitah, the "place of arms" mentioned in Alma 47:5 where rebellious Lamanite soldiers fled, was likely an obsidian outcropping used to produce the dominant weapons in the area, near the Lamanite heartland in the land of Nephi. Remarkably, we now know that for the people of Chiapas, the vital mineral obsidian mostly came from El Chayal, a big volcanic outcrop near Guatemala City, the prime candidate for the city of Lehi-Nephi (which became a Lamanite capital after it was abandoned by the Zeniffites; see Alma 22:1), where the archaeological site known as Kaminaljuyu is largely covered by the modern city. El Chayal qualifies well as Onitah in the Book of Mormon (p. 608). Further, lines of confrontation between Mayan groups and Mixe-Zoqueans in the region, as identified by modern scholars, also may correspond with Nephite and Lamanite boundaries in the Book of Mormon (p. 609). One of Sorenson's strengths is his vast body of knowledge regarding evidences for ancient contact between the New and Old Words. Primarily in Chapter 9, "Transoceanic Voyages," and also in Chapter 12, "Human Biology," he provides conclusive evidence that there were episodes of transoceanic contact between the Old and New World before Columbus, consistent with general Book of Mormon claims. He delves into several topics with rich examples and references, especially for plants and diseases. One of the most interesting discussions, in my opinion, involves the hookworm (pp. 159-160). The hookworm points to ancient human contact via oceanic crossing, not wandering along the Bering Strait, because the life cycle of the parasite requires warm soil. A people moving through the Bering Straight would become hookworm free by the time they reached the Americas. The pre-Columbian presence of this southeast Asian parasite in a Peruvian mummy dating to AD 900 and in much older Brazilian remains (ca. 5000 BC) seems to require one or more ancient transoceanic voyages by human hosts from the Old World to the Americas. This is one of an abundance of evidences Sorenson provides for ancient transoceanic contact between the Old and New Worlds. It is not central to his thesis relating to the Book of Mormon, but is supporting evidence for the plausibility of the kind of migrations described by the Book of Mormon. Sorenson repeatedly explains how little is known about many key regions and specific sites, many of which have not had extensive digs. Some, of course, cannot be explored adequately because they may be covered by modern cities or, in some cases, by lava flows. Others are in difficult terrain, often coupled with political and security risks, making exploration difficult and dangerous. But we hope much further exploration will take place. Sorenson offers many hints about regions in need of more research, and even offers what may be taken as tentative predictions of some things to look for. For example, Laguna Mecoacan is identified as a good candidate for the City of Moroni (Alma 50:13) which would sink into "the depths of sea" (3 Nephi 9:4), possibly into the lagoon. This would be an intriguing find, though the city was probably small, having been built primarily for defensive purposes in a war. But finding a sunken city there dating to around 50 A.D. would be interesting. A more important place to investigate might be the candidate Sorenson offers for the Nephite city of Bountiful. He feels it should be at the mouth of the Tonala River, about 6 miles downstream from La Venta. The modern community of Tonala is built over a large archaeological site overlooking the mouth of the river. There is a large pyramid there, and it is in its debris where the town's cemetery is located. Sorenson states that as far as he known no trained archaeologist has even visited the region, much less conducted detailed investigation. If future work there shows that it was inhabited during the Late Pre-Classic era, corresponding with the Book of Mormon description, this could be another interesting correspondence. Tomorrow, like every Sunday, live every day of our lives if we're wise, we will remember the greatest victory of all time, the only one that really matters because it is the one that gives true meaning to life. We will remember the moment that put an end to endings and gives us the hope of clean slates, new beginnings, and ultimate joy. We will remember and worship Him, Jesus Christ. This video comes from the Church's Easter website, Because of Him at http://easter.mormon.org/. The first part of a series of articles on the Arabian Peninsula and the Book of Mormon was just published in Meridian Magazine. "Beginnings: The Discovery of Nephi’s Bountiful" by Warren Aston retraces the events behind the discoveries relevant to the Book of Mormon in the Arabian Peninsula. Part 1 looks at the formulation of the hypotheses Warren Aston wanted to test. As a result of work by a few individuals, we now have remarkable treasures of knowledge regarding the Book of Mormon and evidences supporting the plausibility of First Nephi, as I discuss on my Book of Mormon Evidences page. Meeting Warren Aston last year in Australia was one of my highlights for the year. I am inspired by his story and how much good one man, entirely self-funded, was able to do. But much remains to be done to more fully explore key sites in Oman, Yemen, and Arabia (not to mention the New World!). The surface has barely been scratched. What an exciting time to be a Latter-day Saint.